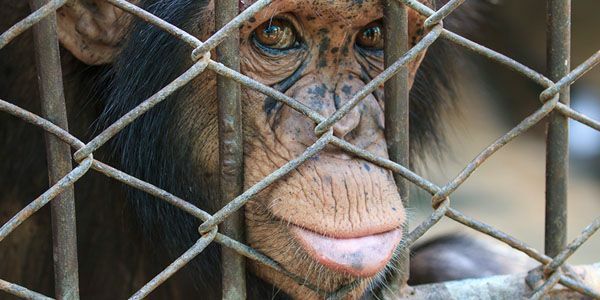 petition: Free Tortured Chimps to Sanctuaries! Free Tortured Chimps to Sanctuaries! recipient: State Supreme Court in Fulton County, N.Y.
Tommy the Chimp spent the first 30-years of his life living in horrible conditions. Today, he is living in a cage inside of a used trailer lot. Chimps are still having to endure torturous science experiments that include being injected with a wild variety of diseases. Some female Chimps are used as "birthers" and have their babies immediately taken away so they too can be medically tortured, After retirement, many have no proper place to go. As a result, "The Non-Human Rights Project" has filed a petition in New York Courts asking that Chimps be given the right to the same liberties as a human being, with limitations of course. Chimps like Tommy are frequently depressed and sick from years of improper treatment. We owe it to them to make sure they can live the rest of their lives in peace, health and happiness; not in a cage. The United States is phasing out the use of Chimps for medical experimentation and this cannot happen soon enough! But in the meantime, ask the State of New York to send a message to the entire Nation demanding that Chimps be free of the type of ownership that does not give them the right to a healthy, happy life! We (the undersigned) respectfully ask that you grant the petition for writ of habeas corpus, for all Chimps in the United States. These Chimps have been subjected to horrors all of their lives and it is time their rights as living, breathing members of this earth are taken into consideration. Please do the right thing and save these honorable Chimps from further abuse and neglect. Allow them to go sanctuaries.